DePaul Music Students Discuss .. The Walgreens at the corner of East Armitage Avenue and North Dayton Street in Lincoln Park was not always a Walgreens. A quick glance east and west on Armitage affirms that many things that are not what they used to be in, say, 1968. The Starbucks, the LUSH Cosmetics, the boutique gown shops and massage therapy practices. The people were different, too. Today, streets in Chicago’s Lincoln Park neighborhood are lined with private gates that lead to million-dollar single-family homes and boutique clothing shops whose occupants and patrons are more often than not, wealthy and white. It’s not the Lincoln Park that José “Cha Cha” Jiménez remembers. Jiménez is a founding member of the Young Lords, an activist group that was started in Lincoln Park in 1968 and fought to empower Puerto Ricans and fight against city development plans that were destroying their communities. 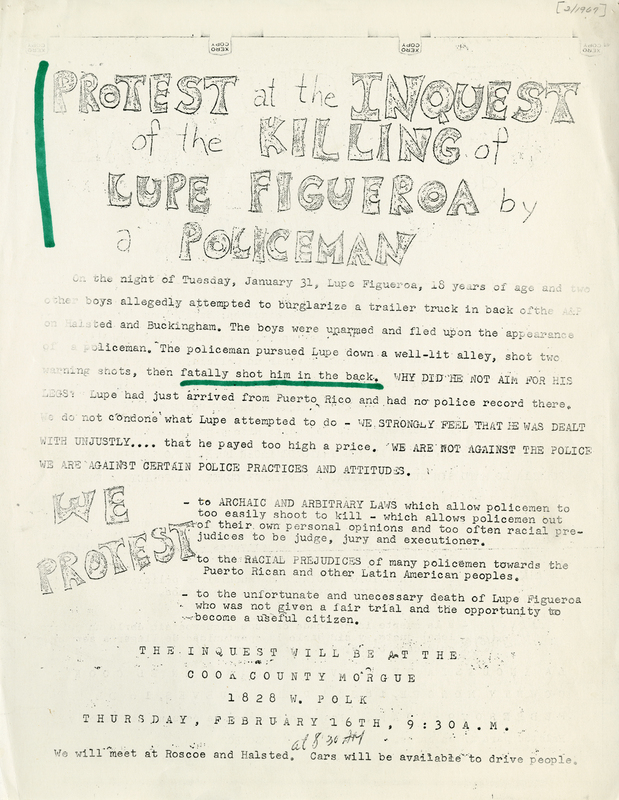 DePaul University has been home to a collection of newspaper clippings, photographs and protest flyers from the Young Lords’ active years in the John T. Richardson Library Special Collections Archives since 2001 when Omar Lopez, the former Minister of Information for the group, donated them to the university. From Friday, Sept. 21, through Sunday, Sept. 23, the Young Lords reunited at DePaul University for a 50th Anniversary in the heart of Lincoln Park, at an institution that played a significant role in the gentrification that the Young Lords fought so hard against. 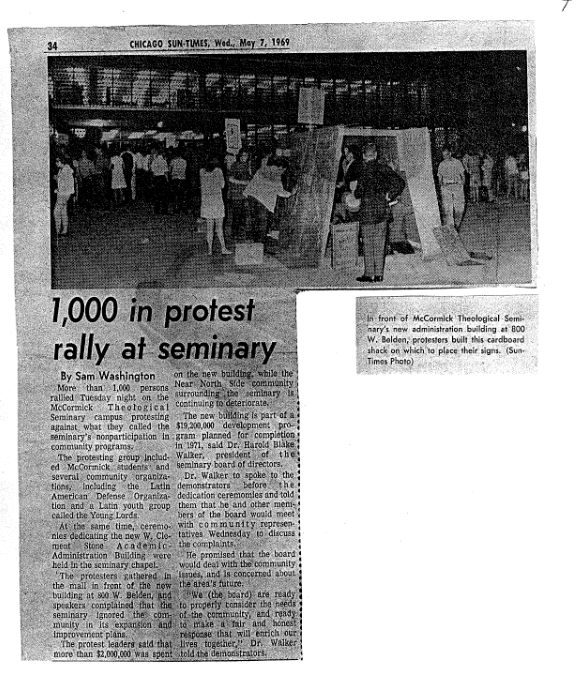 In fact, the McCormick Theological Seminary administration building — which later became the site of a major Young Lords protest — was acquired by DePaul in 1975. The event, open to the public, sold out. I stand in a crowd of DePaul freshmen in the Explore Chicago class — focused on activists and activism after 1960 — huddled around Jiménez on a steamy, late summer day in mid-September, on the corner of Armitage and Dayton. Jiménez is dressed in all black — down to the flat cap atop his head and the rim of his glasses. Time, protests and prison stints have aged Jiménez in those 50 years since 1968. But standing there, on the streets he called home, there is still a sharp focus in his eyes, as if he is seeing an entirely different scene. Perhaps because before there was a Walgreens, before the Starbucks and boutiques, the area from North Clark Street up to North Racine Street and from West North Avenue all the way to West Addison Street was a primarily Puerto Rican neighborhood. But even Puerto Ricans who occupied Lincoln Park back in those days — in the late ‘50s and early ‘60s — had already been displaced from elsewhere in the city. “We kept moving up to Old Town around the Carl Sandburg Village area, but that neighborhood was knocked down, and from there we came here [Lincoln Park],” Jiménez said. The Puerto Ricans that were pushed into Lincoln Park were often met with hostility and prejudice from other ethnic communities in the area, he continued. 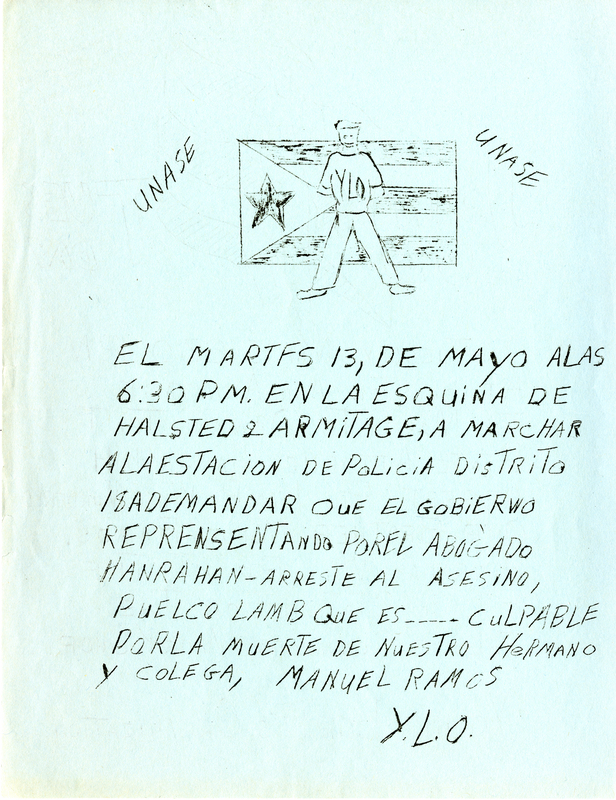 But Jiménez also voiced some understanding for these other groups, suggesting that this conflict was not to blame on either Puerto Ricans or other groups in Lincoln Park, but was rather reflective of a larger problem at work. The pushing was being done by a process called “urban renewal.” Urban renewal is name for a process in cities that means a process of redevelopment in areas that are determined as “urban decay.” Specifically, then-Mayor Richard J. Daley’s “urban renewal” plans that began after World War II, said Jiménez. Thus, the Young Lords surfaced as a street gang. The word “gang” carries a lot of weight, especially situated in the city of Chicago. But their motivations and activities differed from those often associated with gangs today, said Jiménez. 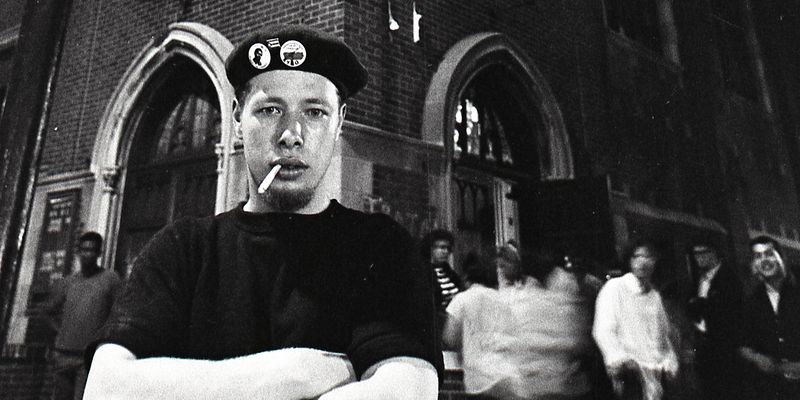 Members of the Young Lords are often pictured in garb similar to that of other activist groups at the time: black leather jackets, turtleneck and combat boots, with the addition of their iconic purple berets. Courtesy of DePaul Special Collections Archive. 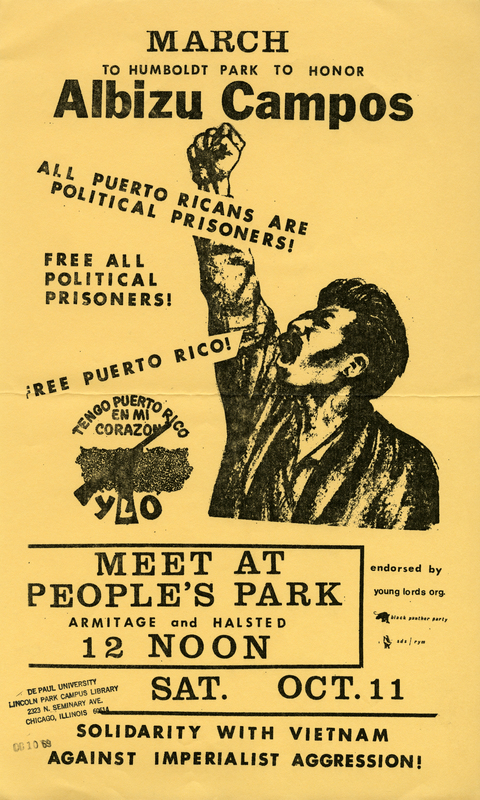 On Sept. 23, 1968 — Grito de Lares, Puerto Rican Independence Day — under the leadership of Jiménez, the Young Lords rebranded themselves as a human-rights movement, specifically focused on self-determination for Puerto Rico, anti-colonialism, controlled neighborhood development and the general empowerment of marginalized peoples. Throughout 1968 and ’69, the Young Lords took part in several movements as well as coordinated their own efforts to stand against segregation and gentrification in Chicago. 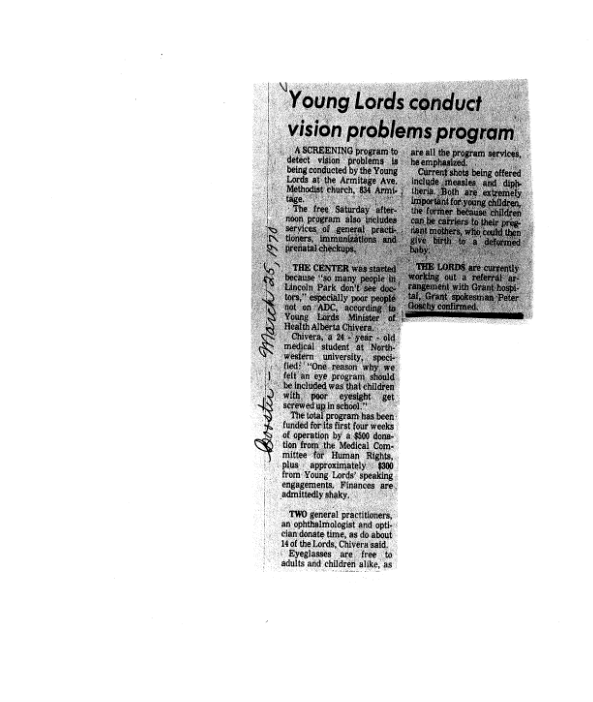 Just after their inception, they broke into and vandalized the Department of Urban Renewal Office and overtook a meeting of a group called the Lincoln Park Community Conservation Council, appointed by Mayor Daley to oversee development in the neighborhood. They threw chairs and shouted “down with urban renewal,” which served as fuel for what became a “preplanned riot” against offices and businesses owned by participants in urban renewal. The Young Lords modeled themselves after — and later, partnered with — the Black Panthers and began holding political education classes for community members in their homes, where they would discuss current political movements and philosophies. 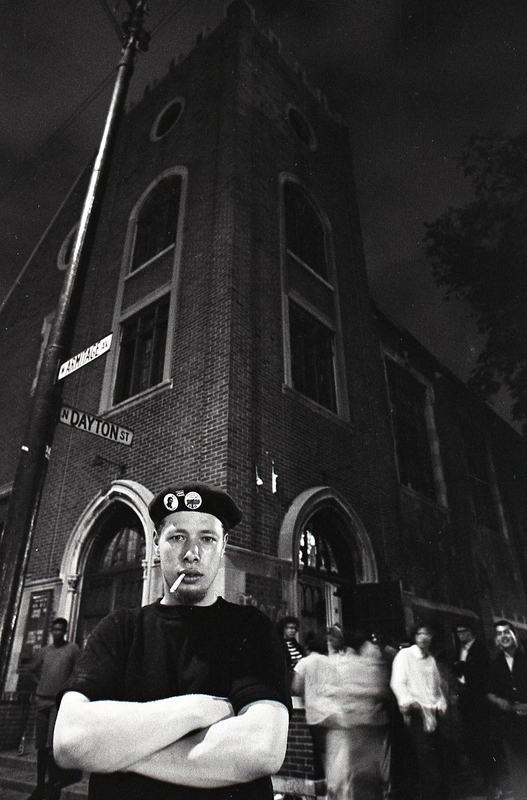 The Young Lords picketed the 18th Street Police Station after Jiménez was arrested following the 1969 takeover of the Urban Renewal Office, one of several times that Jiménez was arrested following a protest. They began programs at the Armitage Avenue Methodist Church — which is now the Walgreens on Armitage and Dayton — including a free breakfast for children every day, a free health clinic, a Puerto Rican cultural center and a free community daycare. They marched with 10,000 people from Halsted to Armitage, into Humboldt Park to stand with Don Pedro Albizu Campos, a Puerto Rican attorney and politician who lead the Puerto Rican independence movement. These were busy years for Jiménez and the Young Lords, who, by the way, were in their late teenage years and early 20s during this time. And perhaps most famously, in May of 1969 the Young Lords led a complete takeover and week-long sit-in of the McCormick Theological Seminary administration building until a list of demands were met, including investment by the city into free health clinics and low-income housing facilities in Lincoln Park. Keep in mind, this was all 50 years ago. But step off the Armitage Brown Line stop onto East Armitage Avenue right now, and it’s hard to say that much has changed. Friday opened the 50th Anniversary event in McGrath Arena with a keynote dialogue, including Jiménez himself as well as Óscar López Rivera, a Puerto Rican independence activist who was held as a political prisoner for 40 years before being pardoned under the Obama administration. Dr. Jacqueline Lazú, a professor in the Department of Modern Languages at DePaul University, was the main event organizer, as well as the moderator for the opening panel. 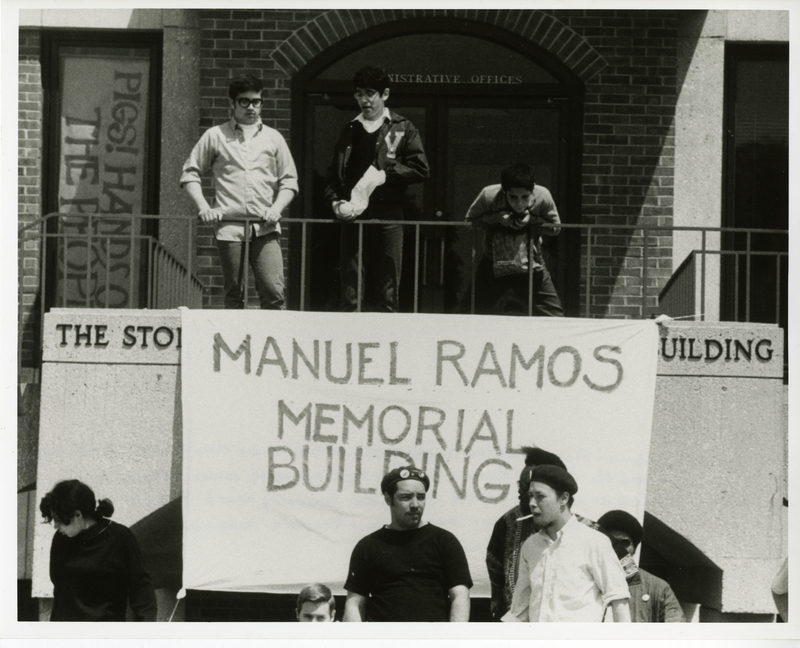 Excited undergraduate volunteers scurried around the flow of professors, faculty and who appeared to be some of the original members of the Young Lords or subsequent activist groups, clad in the group’s iconic purple berets. The dialogue covered a lot of ground, beginning with the root of the Young Lords’ mission and the mission of similar activist groups: to end the vicious cycle of displacement that Puerto Ricans and other ethnic groups have been forced into by systematic forces in the United States. What Rivera is getting at is the idea that this goes further back than Lincoln Park, or neighborhoods before that. The issues the Young Lords dealt with and that activists still deal with today are tied to century-old acts of colonialism by the United States. This has been a recurring theme in the story of the Young Lords: that the real pushback, the real fight, was not with other ethnic groups or rival gangs in the street. It came from the top, down. But here we are, 50 years later, many of the same groups dealing with many of the same issues. In the past six months alone, families immigrating from Central America were torn apart by federal agencies at the U.S border. The Chicago Police Department has shot and killed 92 people over the past six years, about 80 percent of which were black males. And a full year after Hurricane Maria devastated the island of Puerto Rico, it is now known that nearly 3,000 people lost their lives in the wake of the disaster — with little response by the U.S government. It goes back to the first time I spoke to Jiménez, in front of the Walgreens that was not always a Walgreens, when he was standing amongst spas and luxury cars that used to be his battlegrounds, in the reality he fought to prevent.